Ben Holladay was the oldest of eight children born of the marriage between William Holladay and Margaret Hughes. Ben was born on October 14, 1819 in Nicholas County Kentucky and died at the age of 67 on July 8, 1887 in Portland, Oregon. Ben Holladay was not an educated man, but he possessed a strong drive to be successful with a warm and friendly personality. He left his home in Kentucky as young teenager when he boarded a riverboat on the Ohio River to the Mississippi and on the Missouri River to Liberty Landing. There he was met by his uncle, Andrew S. Hughes, who was a lawyer in Liberty and the instigator of the Platte Purchase which was signed in 1836. Hughes was an agent for the Indian tribes and was a signor of the treaty as a sub agent. 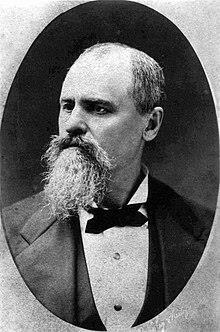 In 1838, Holladay first arrived in Weston at the age of 19, along with his cousin, Bela Hughes, son of Andrew S. Hughes. Bela Hughes later purchased half interest in city of Weston from original owner, Joseph “Joel” Moore. Holladay lived in Weston from 1838 until 1858. During his early years in Weston he owned a dry goods store, drug store, meat packing plan, a hotel and various farm properties. All of this was accomplished by age 23. He was also the first postmaster of Weston. In an article written by Jack Sullivan, “Ben Holladay: The Man and His Whiskey”, he writes, “by 1864 Holladay was accounted the largest individual employer in the entire United States and during his lifetime was as celebrated a figure as Bill Gates is in his own time. “ He had gone from Weston postmaster to multimillionaire, only to lose his entire vast empire in the stock market crash of 1873. A number of books have been written about Ben Holladay, but the two most notable are by J.V. Frederick and Ellis Lucia. The internet has a multitude of various articles written about Holladay, but his exploits and notoriety have been lost or misplaced in much the same way Weston was once known as the “town that time forgot”. The saga of Ben Holladay and the early history of Weston from 1838 to 1865 ran on a parallel upward spiral to fame and fortune before both came crashing down following the American Civil War. Jerry Adams and Louis Smither are both descendants of Mr. Holiday and both members of the Weston Rotary Club.